I get many emails addressed just to me which I believe would be of interest to many others so I will post them up on this page for all to see. I will exercise discretion on what is posted and reserve the right to edit them. Any issues with this – please let me know. But – as always- if anyone does not want to be referred to on this web site – then please let me know and I will respect that. Remember – click on any thumbnail to enlarge it in a new window. And you may need to use the ‘zoom’ feature under the ‘view’ command to enlarge some of the older photos even more. Enjoy! I worked at Mining & Chemical Products from 1963-65 and while I was there I met Bert Hopgood who was in charge of the workshop. He lived at 90 Alpine Street and was the first genuine communist I had ever met. He was very sincere, told me all about dialectical materialism ( which I knew nothing about, even now I’ve never read Karl Marx’s book) all in all a very interesting man. I mention this only in passing, reference Sally Thomas’ post relating to her being related to the Hopgoods. Yes its my sister! Living in Stamford with her husband Clive – 3 grown up children and plenty of Grandchildren! My brother Victor went to the school too. David Wiffen – is this your sister in Mike Sharp’s photo? Such a long time since I was in touch or even thought about my younger days. Hubby is still with us. Just over 2 years now since he was diagnosed with cancer. Still having lots of tests and we live one day at a time. 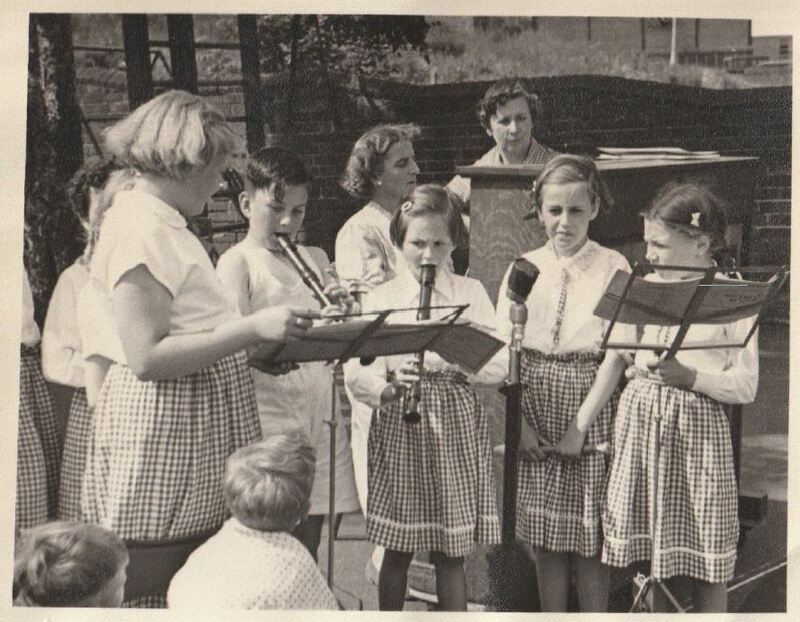 & of the recorder group with me (the only boy as I remember) and I am certain the girl to the right of me in pic was Sonia Wiffin with Miss Scoble on piano. I lived with my grandparents at 34 Field Rd ( Gordon grocery store) there was Matthews veg shop and Gerry’s fish & chip shop on the corner. The fish shop caught fire one night and Grandad told me to run & tell Gerry . Gerry, I called out, the shop’s on fire and he ran up the road into the shop and picked up the cash till and ran out again. ha! One other sad tale was the bread delivery was made by horse & cart. One day the horse was standing by Jesse Terrace and put his neck over the spiked railing gouging his neck – he wore a big sheep skin bandage after. Have recognised some names from the web site that I would have been at school with, also brought back memories of Stony Hill etc riding our scooters down the hill and screeching to a stop at the bottom. I’m sure I will have other stuff lurking that might be of interest – I actually have the coroner’s report into the railway death somewhere. My Royal Marine Commander GGG(G? )-GFather was at Trafalgar with Nelson – 2IC of the Pickle, which took the news of his death back to London. One of mum’s sisters had a pub, I think in Tilehurst up until the 60’s or 70’s. My dad used to go poaching in Windsor Great Park and the boys remembered pheasants hanging in the house. I live in Redcliffe, Queensland, but was born and raised in Rowville Victoria when Rowville was market gardens and dairy farms and the school had 26 pupils. My brothers were born in the UK but I arrived after they got here. At one time I believed my dad was the first Biddle to leave Reading in the 400 odd years I have his tree back, but I have since found a few distant cousins transported in the 1850’s so he lost that title. I’ve been doing the family trees for about 12 years and am now putting information together in a readable volume to leave for posterity which has led me to doing wide ranging internet searches about the history of the places with which we are associated such as Coley and Reading in general. That was how I stumbled across your site. I have also made two trips home to look for records and take my own photos, although I really haven’t spent a lot of time in Reading per se due to time constraints on both trips. I had visits to a few places planed last December but we had to cancel as my daughter (living in London) had organised a surprise trip to Wales. It may be of interest to you that my great, great grandfather was one of the brickies who built the Huntley & Palmer’s iconic chimneys. He met a terrible end falling from a train at Goring in 1862 on his way to a job on a bridge there. Most of dad’s mum’s side of the family were in Mapledurham where I was very fortunate to be allowed to photograph inside and out of one of the cottages that some great greats lived in for many years. 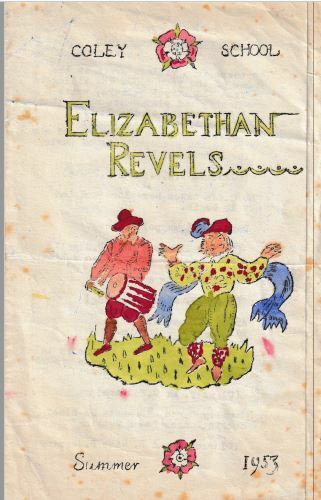 I did, in fact, have a private meeting organised with Sir John Eyeston at Mapledurham House to look at some old records of his estate workers but he was taken ill and had to cancel. My brothers were born in 1938 and 1941 but if they were up in Albert Road you wouldn’t have been at the same school. There is, though, a very good chance they had cousins down your way. I will have to look into it and get back to you. I will get around to buying credits for the 1939 register when I have time to look up all the records I need before the credit expires. It’s a shame i can’t answer Sally as i lived at number 127 Wolseley Street from 1955-85. 1951 from Albert road (Also now gone) as are the infamous Coley Steps where my mother’s family lived (Holly and Ivy Courts). Our name was Biddle, but I’m also related to the Hopgoods. Hi John. Thanks for sending on your recent post. Always a pleasure to read. Just a thought, are you on Facebook? I have recently joined a group called History and Events of Coley, Reading. Might be worth a look if you get chance. Feel free to pass on. I really love what you have put together for Wolseley Street. Just to fill you in on the houses near the school past Stony hill, my Nan Pauline Bunyan has lived in number 62 all her life through the war and is still there now. Her husband Harold Bunyan passed away 8 years ago and her son David now lives across the road in number 85 “I think” but her other son Michael passed away around 10 years ago. A lot of the people that live or have lived on the road are related to my Nan as I have seen her cousin in a picture too. My father Carey Moore also did his apprenticeship at Herbert and Lascelles. He was 5 years older than you (1938) and then went on to work for the SEB. 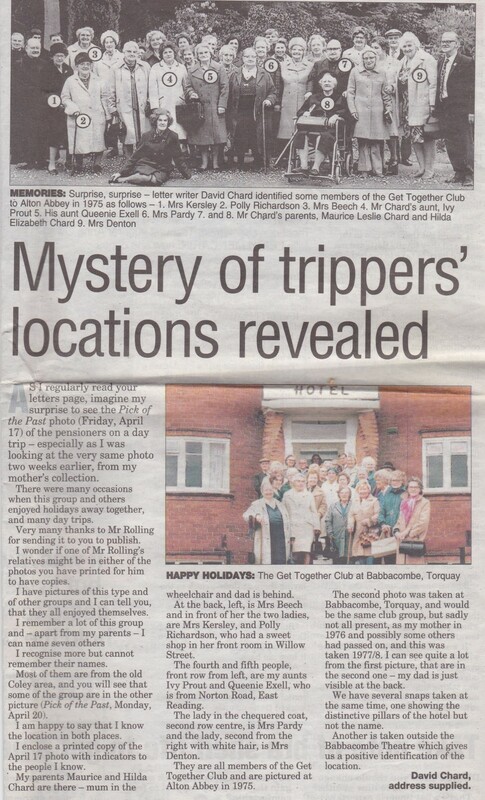 With reference to the great picture of Coley people waiting outside the Brickmaker’s Arms about to go on a day trip to Bognor – which in case you don’t remember can be found under the Wolseley Street tab on the home page. Click on the tab, then scroll down to Contributor’s corner and then across to Brickmaker’s Arms. This photo has appeared on Facebook and some additional names have been suggested. Sue Duffin says that 28 is Tony Mackay and 27 is Terry Mackay, her cousins. Diane Rayburn says that no. 18 is Tommy Absolom. Michael Millam says that number 22 is his sister Margaret Millam & number 12 is his mother Anne (Nancy) who lived with his father Frank in Garnet Street. Caitrin Ackerley says that her mother thinks number 7 is Mr Meats from Garnet Street and also thinks that 14 and 15 are the Everett sisters also from Garnet Street. According to the Kelly’s directing listing I have on the web site, there is a Hector Mears at 1 Garnet Street but I couldn’t find the name Everett on the list. Just found myself as Elizabethan guard with the two trumpeters. One of which is David Watkins who later on was a professional with the James Last orchestra. Lived in Field Rd with my Grandparents who had the grocers shop on corner with Fish & chip shop (Jerry) and Mathews vegetable shop. And glad someone else remembered Miss White and her pencil. Did you go home for dinner. Living almost opposite? I did. I might have stayed to school dinners if they’d fed us war time chipolatas from Bert Bristows, with mashed potatoes, fried onions and a dollop of Heinz Beans… Or egg and chips. My Happy Days in Brook St West. By E. Clift. As you stated in your issue on May 24th Brook St West has changed beyond all recognition. From about 1926 until my call up into the army in 1939, I lived at no 2 Brook St West, which by my reckoning, was the house next door to where the two ladies are talking. I think I knew both of them. Just about where they were talking is just about the spot where the Castle Street exit comes off the inner ring road towards Caversham. My sister returning to Reading from Australia after 30 years, was devastated by the change. Both of us liked Brook St West as it used to be. For Ernie Clift the Generation Game is all part of Coley’s charm. He was born in Brook Street West in 1918 and went to Coley School in Wolseley Street. Her niece Linda Dalfsen was born there in 1955, and also went to Coley School.